I knew something was up with the styling bucks Bob Lutz showed on 60 Minutes a few weeks back. The one they showed the back of was way too sporty for a CTS sedan with a very rakish rear window. Over at the Caddy Edge, I predicted that this was actually a CTS coupe...and much joy ensued. 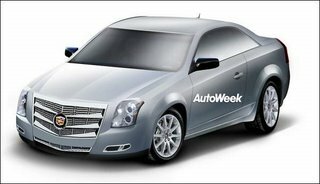 Now, the rumors are more official since Autoweek (the above sketch is from them) and Automotive News are both reporting it.